The weekend was less exciting than forecast from a cross country point of view, though the weather on Saturday was quite exciting with big showers and hail. On Sunday it was all a bit calmer, so Graham decided to try out his new 'instrument flying' hood. For this he needed some brave - or foolish - person to sit in the front and tell him where he was. Unfortunately the battery he chose didn't have much life in it so the turn and slip was a bit uninformative, and it turned out that the compass was low on fluid and wasn't much help either. Instrument flying without instruments is really better as a spectator sport. After Saturdays excellent day of flying activities, the run of good weather has continued with Sunday being very busy as well Monday and Tuesday. Several private owners rigged with plans for Lyneham O/R but unfortunately the weather didn't enable the task to be flown today. The blue skies and sunshine has probably resulted in a few folks getting a little sunburnt (a first for 2013!). 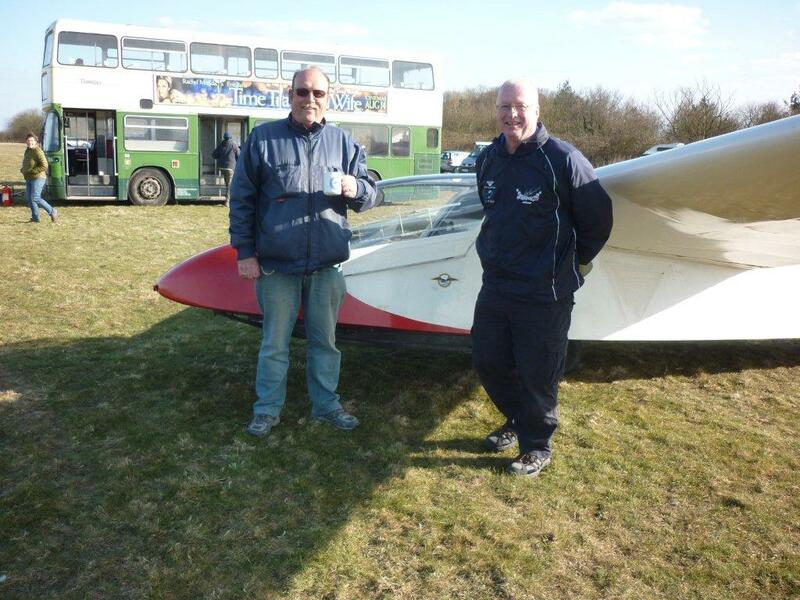 We had another first solo with James Blanch taking to the skies in KLA. James flies commercially for a living but he made an interesting comment after landing that "this is the first time I've been in an aircraft on my own for over 10 years!". In spite of the several thousand hours flying he has, his grin on landing was no different to any other pilot when they first solo. Congratulations James. You may also have noticed two other new faces around the launch point recently - more specifically in the tugs. They are Callum and Gus the 2013 seasonal tuggies - say hello to them and remember to buy them the odd lunch or drink in the evening for all the good tows you are going to get from them. The club was out in force today to make the most of what was forecast to be a very good day. Richard set a task using Tim's racing formula and the grid waited for the kites to demonstrate that the thermals were working. Eventually Wayne and William launched, with the original 250k task programmed in. Meanwhile, back on the ground there was a bit of a re-brief and the rest of us set off on something around 160k, the distance depending on the handicap of the glider (no allowance for competence of pilot). Everyone got back apart from Jim, who carried out his first field inspection of the season. ﻿On the other side of the new bus was a colourful selection of wood, pride of place given to Graham's Lunak, now gracing the skies again after a 3 year battle with EASA. The excitement must have got to him, he was spotted doing axis rolls on downwind. 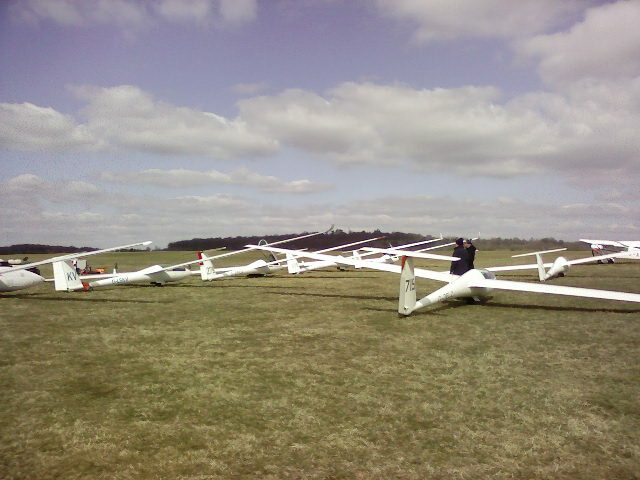 Lots of flying, lots of grins, that's more like gliding﻿! With a bit of judicious juggling, I got out of the office last summer mid-week. In fact it was so hot, people were hiding under glider wings.. can you remember those days? The conditions looked very good and I was thoroughly enjoying flying from Haddenham. 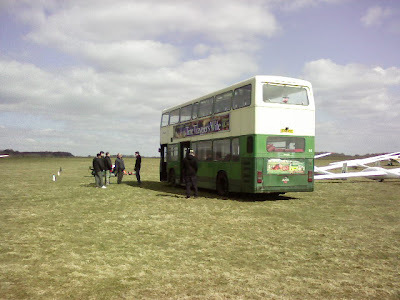 I also had a cunning plan: I would convince an instructor to accompany me to Bicester for a supported XC. It's a run I've done a lot on Condor (Gliding simulator)… sorry, wrong emphasis. I've done it so often that even my wife recognises the scenery over my shoulder, "For crying out loud - are you flying to Bicester again! You can fly anywhere you want on the computer - Norway, Canada, the Alps - and yet you fly Bicester! " Navigation couldn't be simpler - if you are at a decent height, you can see Bicester. And if you are lower, you just follow the railway line NW. And roughly half-way the railway splits in two. Easy peasy. My telepathy must have been strong because Richard said, "Let's take the duo for a ride". Now I am a bit of a Vintage fan, and I love Will's epic flights in his K6 and yearn to emulate them. So I can't lie when I thought, "The duo is ...erm… not a very colourful glider? Where is the challenge in flying this?" Yes I know - I was a heathen. What a delightful glider to fly. Considering its such a heavy lump on the ground, it is a delight in the air. And the performance both in climb and especially on cruise is astonishing to somebody with most of his hours in a K13! And so we flew - but Bicester was not enough; with a cloud base of nearly 6000ft we ran North of oxford, back across to Bicester and then home at 100kts+ to make "best use" of our energy. And as I got out of the cockpit, I had to shatter my preconceptions. Yes - Vintage gliders are achingly beautiful - especially the Sperber Junior. And if you are as skilled, ambitious, and determined as Will then a K6E is capable of epic adventures AND get home. 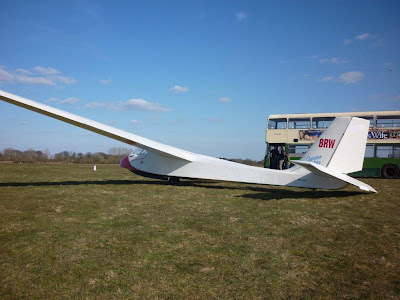 But the beauty of a club class glider (ASW19, Pegasus, Libelle) is the possibilities it presents me as a pilot of humble skill, and very little experience. On a good day, I could get good enough to fly the Pegasus amongst the hills of Wales and back within the next 2 years - and that is something that greatly excites me as a goal. The duo needs a health warning, "This may result in turning a glider pilot into a hopeless soaring addict". On Saturday a Slingsby Capstan dropped in at Booker for a bit of comfort. Pilots Merv and Chris were on their way to Dunstable to collect a trophy but the cold got the better of them as they passed by. They were greeted by several Booker acquaintances and were soon enjoying a hot drink from Nick's Tea Bar. Finally spring seems to have arrived, and although it was still a bit on the chilly side, the day couldn't have been more different from Thursday's blizzard. 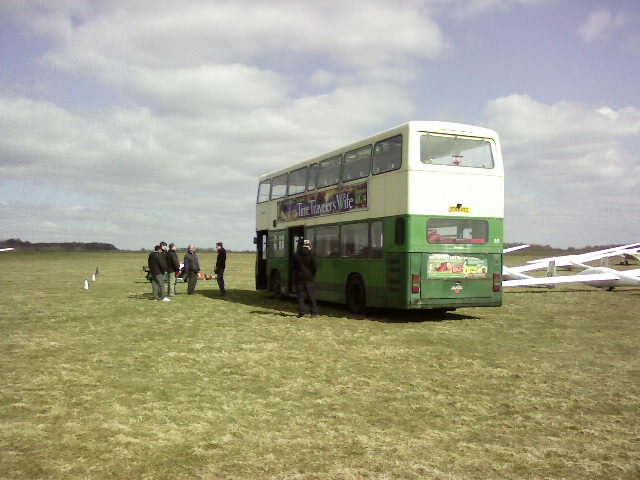 While the grid was setting up, the new bus arrived from Liverpool, home of second hand buses. This will be a great relief after recent days on 06 with no shelter from the biting easterlies. 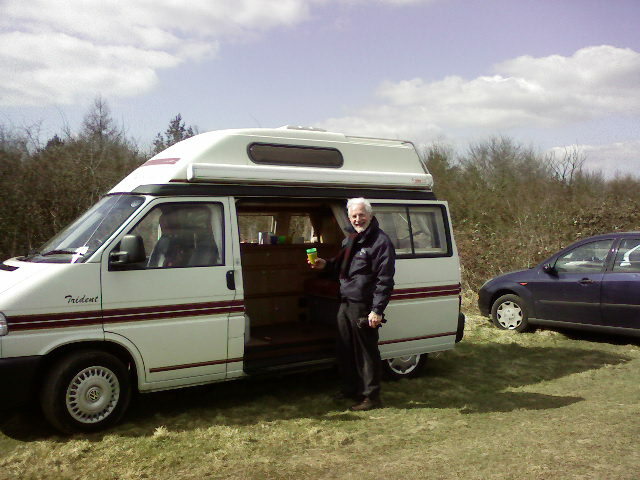 Nick was also on hand to provide hot drinks from his campervan. 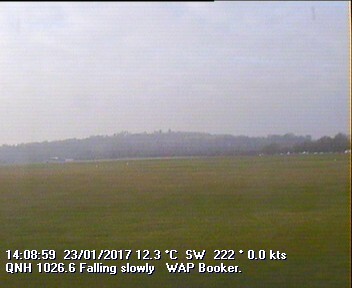 Plenty of people turned out to take advantage of the conditions, which produced 10kt thermals in places, and many did the club task. Will in his K6 is leading the field at the moment with a task of 405k﻿. Hold very tight, All Change please! After 20 years of service Booker's launch point bus has finally decided to stop working. The prognosis to repair it was not good and so a new one has been found and should be on site sometime over the weekend. After the recent run of cold easterlies it will be a welcome addition. Even though it has been very cold and windy, it has not stopped a good level of flying to occur through the week and Tuesday saw a number of fast 300k's by Z3, HA, 786 and GA. Well done guys. The forecast for the weekend is looking good so why not come up to check out the new bus and more importantly to get flying.